All the information you provide appears on the right as a preview of what other users will see. When you’re ready, click Continue. Other user profiles will appear. Following a Socialcast community member is like friending someone on Facebook. It’s probably a good idea to follow the boss as well as your teammates and anyone who reports to you. Unlike Facebooking at work, which is generally frowned upon, Socialcasting is encouraged. In fact, you’ll fast be out of the loop about what’s happening with your team or your projects if you don’t keep up with Socialcast on the job. How times have changed! Join some groups — or start one. 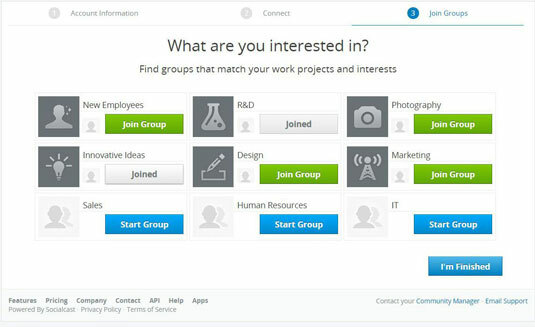 The third and final activation screen gives you a selection of topic groups you might want to join. If you’re new to the staff, for example, you’re likely encouraged to join the New Employees group. If you head up a particular area, you can start that group. You can start other groups on more specific topics after you’ve finished setting up. Click the gear icon next to your name and open the Settings menu. Account Settings: On this tab, decide whether you want to keep your news stream neat and tidy (expandable at will), or if you want it to just let it all hang out all the time. Totally depends on your work style and maybe how busy your news stream is. 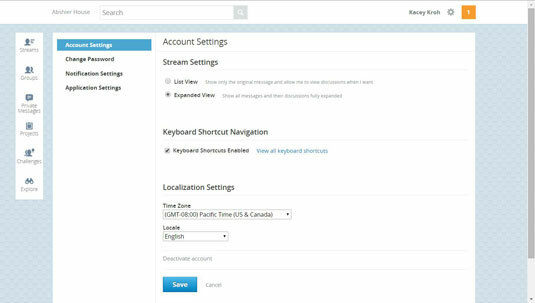 You can also enable keyboard shortcuts and set the default time zone and language. Change Password: This tab needs no introduction. Change it if you want. 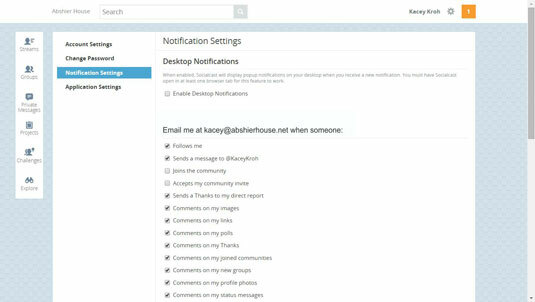 Notification Settings: Choose what kind of events you want to get email notification about (just in case you’re not logged in to Socialcast 24/7). 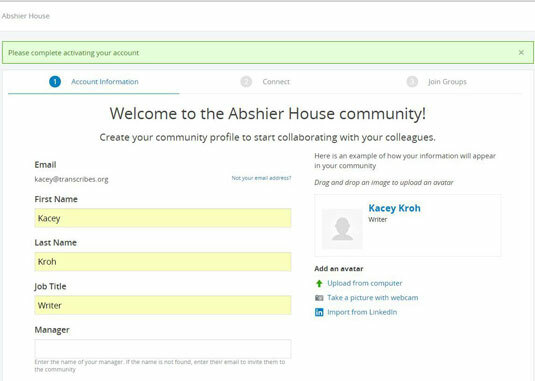 Application Settings: This tab will look differently depending on what applications and plug-ins are integrated with your Socialcast community. Bottom line: here’s where you can make adjustments to those peripheral apps. If you don’t want to have Socialcast staring you in the face, but you want to stay on top of things, check the Enable Desktop Notifications box. Then you can minimize Socialcast and go on about your business. It’s ready when you are; meanwhile it will give you pop-up notices when something happens you want to know about. When you’re done with all that, go up to the top right and click on your name to go to the spot where you enter your personal information. This is where the social part comes in. 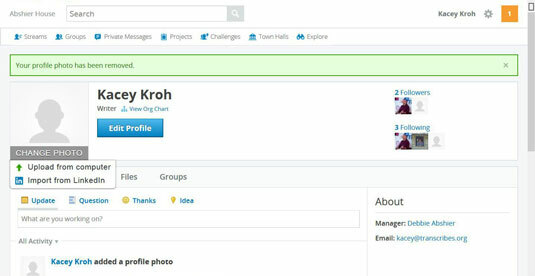 Your profile page is the place to see what’s happening in your world — you can post a status update, post a quick question, offer thanks, submit an idea, visit your groups, check your news stream, see who follows you and who you’re following, and even see where you fit on the company organizational chart. If you hover over the square where your picture should be, Socialcast will give you the opportunity to add or change the photo. 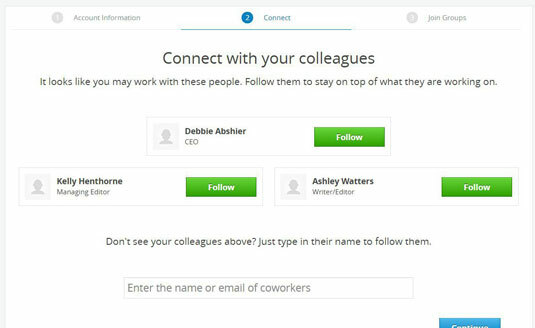 You can add a photo from your hard drive or import it from LinkedIn. After that’s done (or if you added your photo when you initially created the account), next click the Edit Profile button to add some other personal data to your profile. 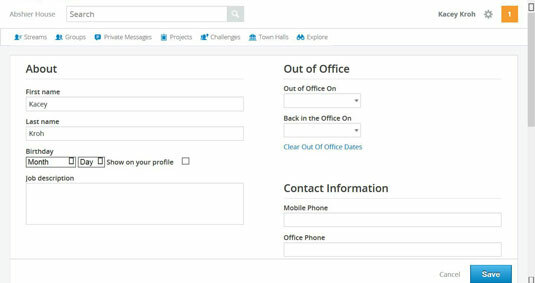 You’ve probably seen forms like this before — it’s pretty similar to Facebook. Your community manager may require some fields be completed (such as your contact info and to whom you report), but most of it is completely optional. Don’t forget to add the links to your other social network profiles, like Google Talk or Twitter. The more information you supply, the better Socialcast can help you make good connections and keep on top of matters that are important to you. So don’t be shy! And if you’re not so shy. . . just remember to keep it appropriate for the workplace. When you’re satisfied with your answers, slick Save to go back to your profile and admire how great it looks. Nice work on getting set up. Go ahead and introduce yourself to the community by posting your first update in the text box below your picture. From here on, Socialcast is easy to learn and follow if you’re familiar with other social media. To further customize your Socialcast experience, you can add some gadgets that will let you mingle Socialcast with some other important apps. From the gear menu, click on Apps to go to the Apps Directory, choose the add-ons you want, and follow the download instructions. 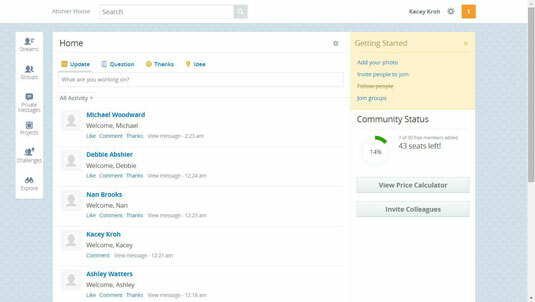 You’ll find gadgets for Outlook, Gmail, HootSuite, and more. It’s also any easy place to grab the app for your mobile device.